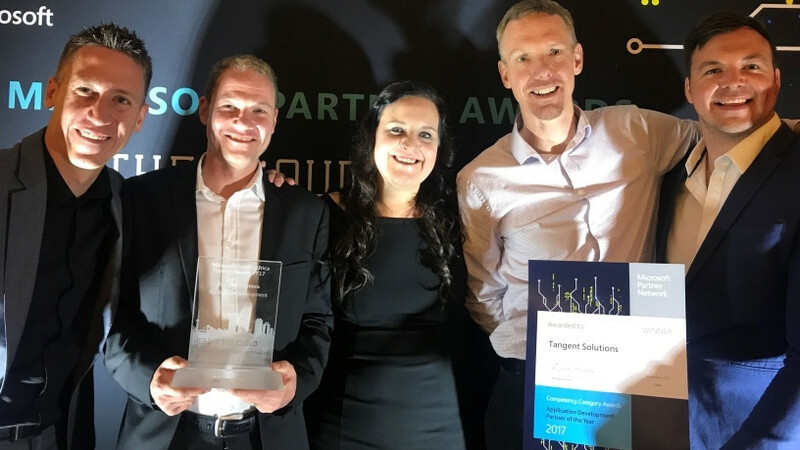 Dave Nel, Andre du Toit, Natalie Brunsdon, Cliff de Wit and Ruaan Erasmus from Tangent Solutions receive the Application Development Partner of the Year award, during the Microsoft 2017 Partner Awards held at Sandton Convention Centre. The Microsoft 2017 Partner Awards, which were held on 14 November at the Sandton Convention Centre, recognised Microsoft partners who build great software solutions for their customers, creating highly differentiated value. Application Development Partner of the Year award recognises the top partner that helped customers to digitally transform by leveraging Microsoft technologies to build solutions - or help modernise their existing apps and put them in the cloud on Azure. David Nel, managing partner at Tangent Solutions, said the team was thrilled with the award. "Tangent Solutions has grown tremendously over the last four years, driving digital strategy, digital transformation, transparency and agility. We always recommend cloud first and cloud-native solutions, bringing innovation and automation to all our customers." "We are empowering our customers to achieve more because we are passionate about the cloud and driving digital transformation. We are providing our customers with a secure, agile environment and cloud based solutions that drive their digital strategy forward," Nel said. "Growth and self-development are at the heart of Tangent Solutions' culture. This cultural foundation offers our customers technological choices based on new technologies and trends, architectural decisions based on new understandings of technologies and the best user experience possible. The entire team shares the same goals around quality, performance, user experience, stability, security and even time to market. Our promise as a company is of mutual success for all our stakeholders, customers, employees and strategic partners. We only succeed if everyone succeeds."